Hi! 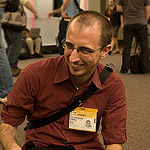 I’m Christopher Fahey and I’m a user experience designer. I live in Red Hook, Brooklyn, New York with my lovely wife Peggy (aka tinydiva) and two nearly-identical looking cats, Nike and Perseus. I was born and raised in Philadelphia and Upper Darby, Pennsylvania, where I built model castles, airplanes, and rockets, wrote my own Commodore 64 computer games, played Dungeons & Dragons, cycled 300 miles a week, sported a mohawk and other punk rock regalia, ate soft pretzels and cheesesteaks, and neglected to learn how to drive. I moved to New York City in 1989 to go to college, and I never left. I still never learned how to drive. In early 2012 I joined the user experience team at ZocDoc, a fantastic New York health-care startup. I made the jump to product development after 15 years of client services, and more than ten years co-managing my own agency, Behavior, a user experience and interaction design studio I co-founded with four awesome partners in 2001. 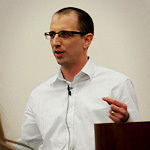 In addition to helping define Behavior’s UX methodologies and processes, I led the user experience design for clients and projects in many industries, including The National Geographic Channel, Cablevision, BusinessWeek, HBO, UNICEF, The Smithsonian Institution, JPMorgan Chase, the AIGA, and The Onion. In my 16 years as a professional interaction designer and manager, my projects have covered everything from social media web sites, securities compliance software, and sci-fi adventure games. My UX design sensibility combines the high usability standards of business-critical web applications, the branding and creative concerns of interactive marketing, and the experimental approach of computer art and game design. Before starting Behavior, I worked at a huge web consultancy called Rare Medium as the New York director of information architecture. Before that I had two dream jobs working as a game designer and producer at two pioneer interactive media studios, Music Pen and Wanderlust Interactive, where I was the lead game designer for several award winning CD-ROM games. I went to art school at The Cooper Union for the Advancement of Science and Art, where students don’t have to choose majors but are instead encouraged to create work that crosses whatever disciplines their inspiration takes them. My focus was on interactive sculptures and installations. I also studied as an exchange student at the Gerritt Rietveld Academie in Amsterdam, The Netherlands. My favorite work of art from college is my map of the world from memory. I have long called myself a designer, although my art education wasn’t focused specifically on design. I don’t know when in the last 15 years my preferred title changed from “artist” to “designer”. I have works of interactive art in the online collections of the Whitney Museum and The New Museum/Rhizome, but most of my work lately has been in the commercial/design sphere. The way I think and feel about my practice, however, hasn’t changed much: I like to build things that people enjoy using. I have written for A List Apart, and have been interviewed for and quoted in articles in the New York Times, BusinessWeek, New York Magazine, UK Design Council Magazine, Communication Arts, and Mashable.com. I am honored to be a member of the faculty of the School of Visual Arts MFA program in Interaction Design, since its inception in 2009. I teach a course in Interaction Design Fundamentals, for which I developed the curriculum. I have also taught interaction design at FIT, Flash design and development at Brooklyn College, and I have guest lectured at the City College of New York. I come from a family chock full of endurance athletes, so it was inevitable that I’d take up the family business. I like biking and running, and in 2007 I decided to learn to swim properly. 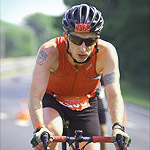 In 2008 I finished the New York Triathlon, my first triathlon ever, and I did the Philadelphia Triathlon in 2009, 2010, and 2011. I look forward to doing many more. In 2011 I ran my first marathon, in 3:44, and in 2012 I’ll be running in the New York Marathon. I’m a news and politics junkie, too. I spend far more time than I probably should following the drama in Washington, DC. Politically, I am a pragmatic liberal. I’ve always been a huge fan of graphpaper. Almost all of my hobbies and interests throughout my life have required the use of graphpaper, from artwork to pixel-based computer design, to role-playing games. I’ve owned this awesome domain name since 1998, when I thought of it on the subway on the way to work and learned later that morning that it could, in fact, be mine for $35. At first, Graphpaper.com was an art site showing off scans of my sketchbook and other internet art projects I was working on. In 2006, I finally got around to redesigning and relaunching Graphpaper.com as a blog, thanks to the convenience of WordPress and the technical help of Pau Santesmasses. Editorially, the site is about anything that’s important to me. Usually, this means user experience design topics — design, technology, social media, games and gadgets. But my primary goal is not professional. Graphpaper.com is a personal site, so I talk about politics, family, music and art, history, pet peeves, and all the other things most bloggers talk about. Future plans include integrating delicious links, twitter posts, a blogroll, and other things that normal blogs have. Follow me on Twitter. I tweet on average around five times a day. See my snapshots and photos on Flickr. Network with me on LinkedIn. I am also active in hundreds of other places, usually under my real name but sometimes using the nom-de-web “askrom“, my online identity from way back in the 1990s when having an alter ego was somehow more normal than it is now. 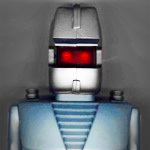 In case you didn’t know, ROM is a toy from the 1980s that I never owned but always coveted.